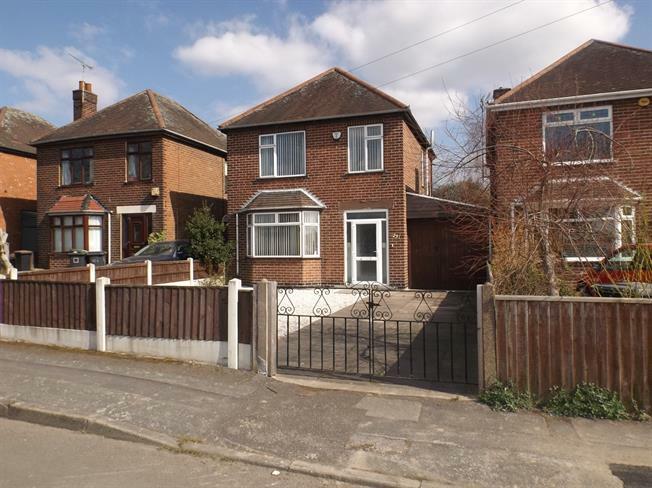 3 Bedroom Detached House For Sale in Nottingham for Guide Price £215,000. Bairstow Eves are very pleased to offer this extended three bedroom detached house which is ideal for a family home and is offered with no upward chain. This particular property has the benefit of two reception rooms, alarm system, double glazed windows and gas central heating. Outside there is a carport leading to the garage and gardens to the front and rear. An early internal inspection is essential in order to avoid disappointment. Double glazed door to the front and tiled flooring. Radiator, cupboard, access to the stairs with windows and a door to the front. Double glazed bay window to the front, radiator and four light points. A good size room with a radiator, coving, four wall light points and a double glazed window to the rear. A range of wall and base units complemented with a work surface, sink unit, room for a fridge, plumbing for a washing machine and a dishwasher along with a double glazed door and window to the side. Double glazed window to the side and loft access with a pull ladder. Double glazed window to the front and a radiator. Double glazed window to the rear and a radiator. Panelled bath with a electric shower over, basin, low level WC, radiator and a double glazed window to the rear.